Actually, I’m not totally done. I’ve been waiting over 9 months for backordered parts that I need to finish. I’m down to 3 silly strips of chrome that go around the windshield and rear hatch glass. It seems that only one guy in the world makes these and he has retired. But we’re close enough that I won’t quibble. I recently obtained a few miscellaneous items off backorder like a grab handle for the dashboard. With the installation of these items the interior is complete and frankly, I can’t see the missing chrome strips around the windscreen when looking out upon that glorious hood, so what the hell. I’m done. I checked back and found that I wrote Restoration Article number one in 2005. I’ve actually had the car on the road since 2010, when I did my best to break something mechanically with a series of autocrosses and track events. Nothing broke, so I moved on to upholstery. Of course, adding the interior totally transformed the car from a track beast to a luxury cruiser. The final effort was exterior chrome. I must say that I have thoroughly enjoyed my time in the shop working on this car. It is very therapeutic after being away from home with my engineering work, which takes me around the country. Having the car to work on was something I always looked forward to when I came home. So what’s next? Well, there will be a coming out party at the CJC Concours at Little Switzerland in July. And I have been pretty busy with my Porsche 944 race car project. 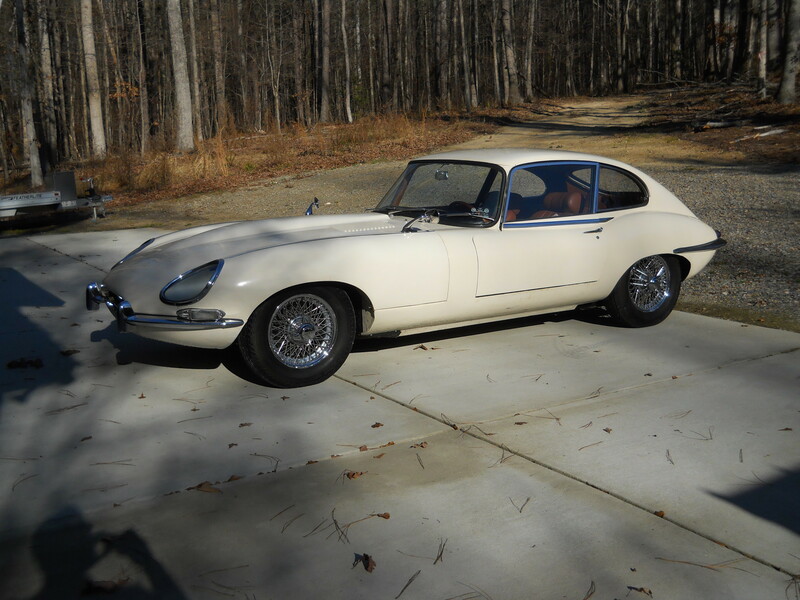 And there is a 1963 E-Type coupe shell with all its parts in boxes waiting in my garage storage area that I am looking forward to getting started on. So there is no lack of things to do. And you’re never really done driving and maintaining an old Jaguar. Now if I can just figure out where those drops of oil under the car are coming from ….